Within Oxfordshire we have some of the most historic buildings within the country. This historic environment enriches our quality of life, and contributes to local character and a sense of place; some historic buildings, monuments, landscapes and areas are of special importance nationally and internationally. The loss of any historical building or article represents a loss which can never be replaced. Due to their age, these buildings have not been constructed to present day fire safety building design standards and many are constructed from materials that are often highly contributory to the development of a fire and which can be easily ignited and consumed. 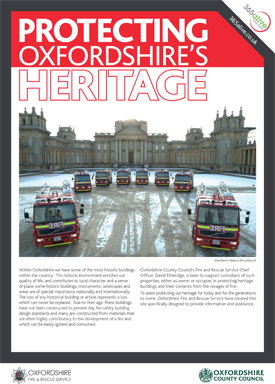 Oxfordshire County Council’s Fire and Rescue Service Chief Officer, David Etheridge, is keen to support custodians of such properties, either as owner or occupier, in protecting heritage buildings and their contents from the ravages of fire. Protecting Oxfordshire Heritage (.pdf format, 5.7Mb) provides information and assistance to help protect our heritage for today and for the generations to come. English Heritage have produced a salvage plan template, we would recommend that a plan of this type is used.